the heat in my apartment is broken and my feet are cold, so i went looking for a little bit of a summertime frame of mind to warm me up – in spirit only, since i doubt the power of photographs and memory when it comes to the physical warming of feet and hands. 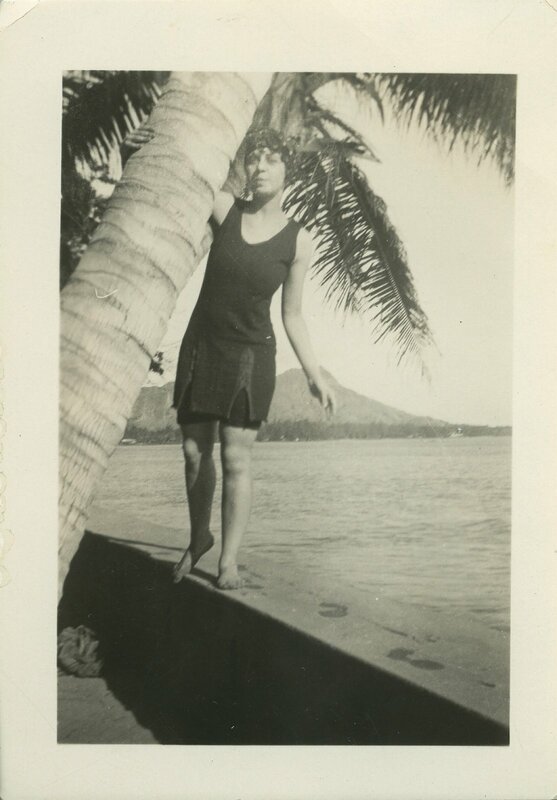 my great grandmother rona went to hawaii in the late spring of 1926 with her maiden aunt rose. i don’t know who was supposed to be acting as a companion for whom – if rona was invited so rose wouldn’t have to travel alone – or if rose was asked if she minded acting as rona’s chaperone. it doesn’t really matter because no one ever complains about a trip to hawaii, unless there is a monsoon or a shark attack or an accident with a volcano. so here is rona, 20 years old, standing under a palm tree on waikiki and posing for a picture with diamond head in the background. it doesn’t really make me feel any warmer, but it does make me wish i were in hawaii – preferably in 1926 when it looked like this. She and I have the same ankles 🙂Also, Nonie had an aunt named Rose? I can only hope this aunt was Nana Ella’s sister, for then she would have been Rose Rose. yes, rose was thankfully ella’s sister and her last name was holzman, not rose. because that would have been weird.but actually, nonie’s original birth certificate says her name is rose – though they sent in a correction form at some point to correct it to rona. she was probably named after her grandmother, rose brown. rose brown is sort of a funny name too, but not as funny as rose rose. Wait a second.Alright, I KNOW Stanley’s last name is Brown. So obviously, that was Nonie’s maiden name. So why do I have the name Rona Rose stuck in my mind? Was that her middle name?I now see that my previous comment makes me seem really stupid. this is just splendid! is she still around? I think I was suppose to be born back then just for the outfits. carefree. k, because rose was her married name, silly. (her middle name was dorothy, just in case you were wondering…)m, thanks! i wish i had the outfits too. It’s been a long week, okay?!?! ?Well, not really. But let’s use that as the excuse. And Maggie, no, she is not still around — sadly, she died of cancer circa 1991. I wish she was still here, though…she was the most wonderful woman, from a combination of what my four year old mind remembers and what I hear of her from others.